The regional cuisine of Alaska is a re-imagining of American favorites using Alaskan wild game, fish, and berries. Isn’t the holiday season the best time for me to bring to you the the reindeer dog (Psssssttt . . . . just maybe don’t share it with your kids)? 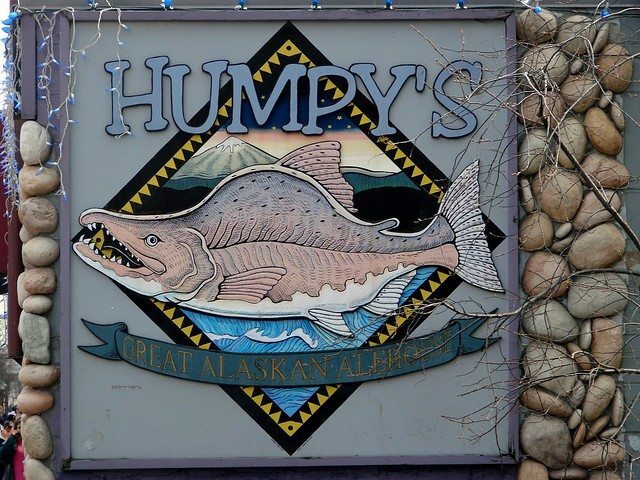 Humpy’s was founded in 1994 and at 20 years old is still going strong. They have Alaska’s largest selection of beers on tap and have new selections weekly. Their food is simple and unpretentious, popular with locals and tourists alike. 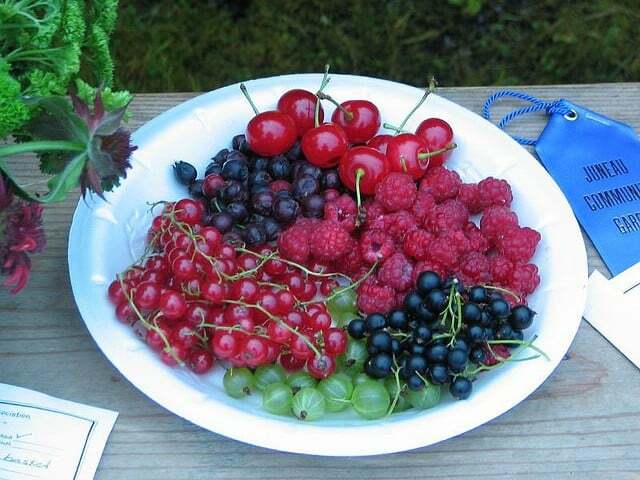 Lingonberries, bog berries, cranberries, nagoonberries, crowberries, blueberries, huckleberries–Alaska has all these and more. You’ll find them in cobblers, crisps and jams and jellies. Almost anyone who has eaten at Humpy’s raves about their berry crisp, served warm with a huge scoop of vanilla ice cream. In most of the world fish ‘n chips consists of battered Atlantic cod or haddock, but in Alaska you have to try halibut fresh from the North Pacific. Historically an important food source to the Native Americans, the fish remains popular in Alaska. The meat has a clean taste and dense firm texture–perfect with a beer batter and some tartar sauce. So now we come to Rudolf. 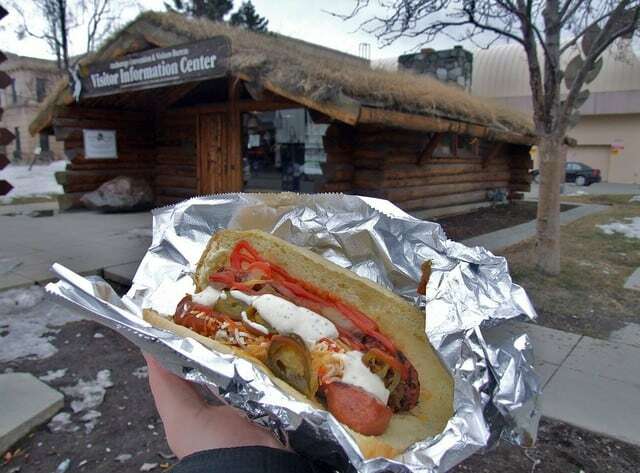 During the summer tourist season Anchorage is filled with hot dog vendors selling reindeer dogs, but the one that everyone talks about is M. A.’s Gourmet Dogs run by Michael Anderson for the last 22 years. He’s known to some as the hot dog Nazi (a reference to Seinfeld’s soup nazi). A handmade sign says: “End all cellphone talk at the counter, end all conversations with other diners when it’s your turn, wait to order until “the wienie behind the stand asks for it,” and finally, step to the right “and pay for this abuse.” Signed: “XX00. M.A.” But the long line moves fast, and that’s important when a big chunk of your business is from locals on their lunch hour. You’ll find lots of people talking about a less than 100% reindeer dog being inferior, but reindeer meat is too lean to make a good hot dog on its own. So yes, M. A.’s hotdogs are mixed with pork and beef–and that’s part of what makes them so good! The second way Alaskans enjoy their reindeer meat? Sausage. The best place in Anchorage to have breakfast? 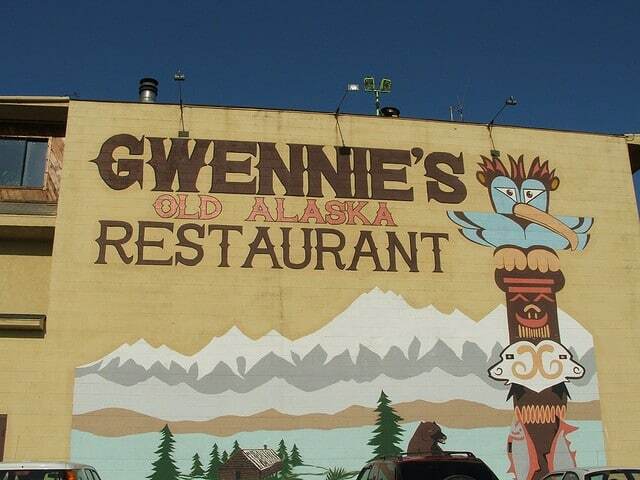 Gwennies Old Alaska Restaurant. Gwennie’s has been around for 30 plus years. The decor consists of historic Alaskan photos and memorabilia. They are best know for their huge portions and sourdough pancakes and reindeer sausage. If you have a strong stomach try them with the best Blood Mary in Alaska. Have you ever known anyone who went on an Alaskan cruise and didn’t bring back smoked salmon? It has to be one of the things that Alaska is most famous for. If you want straight smoked salmon pick it up at 10th and M, but for some Alaskan cuisine you have to try the International House of Hot Dog’s smoked salmon Quesadilla: A flour tortilla, quality smoked salmon, shredded Mozzarella and cheddar cheese, caramelized onions, and their secret chipotle creme. The proprietor, Rodolfo Portillo, who’s originally from Mexico, works with his family to offer a wide variety of hotdogs–and I know, here I am going on about quesadillas. This is a food truck operation, but they have set up outdoor seating. And if you’re in the mood for Mexican food you might want to try out the tamales–his Mama makes them. If you think it’s too cold to travel to Alaska right now, try my berry crisp in the comfort of your own home. Preferably in front of the Christmas tree where Rudolf is safe and sound in ornament form. Place berries in a slow cooker. Mix remaining ingredients in separate bowl and sprinkle over top of apple and cranberries. Place 4 or 5 paper towels over the top of the slow cooker, place an object (I use a wooden spoon) across the top of the crockpot and set lid on top. This allows the steam to escape. Turn slow cooker on high and cook for about 2 hours. Note: Since you probably aren’t going to find some of the more exotic berries at your local supermarket try mixing a little lingonberry jam in with your other berries. Check out All She Cook’s other great crisp recipes. Caramel Apple Crisp would be a beautiful presentation for your Christmas get-together, or for something a little different try Rhubarb Crisp, a Wisconsin favorite. But don’t forget good old basic Apple Crisp. And make sure you top them all with a big ‘ol dollop of vanilla ice cream. Wow, these foods are really cool and delicious sounding foods. A smoked salmon quesadilla sounds like it would be super tasty and very unique. It must be even better than any other ones like it because they are getting Alaskan salmon.